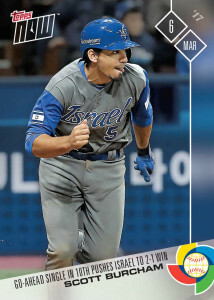 Israel’s 10-inning victory over Korea on the first day of the World Baseball Classic™ gets the first Topps Now treatment as Topps, the exclusive trading card partner of Major League Baseball, and the WBC are teaming to bring baseball fans exclusive, tantalizing Topps Now™ cards starting today. Scott Burcham‘s two-out RBI single (pictured at right) is one of three cards immortalizing the win. 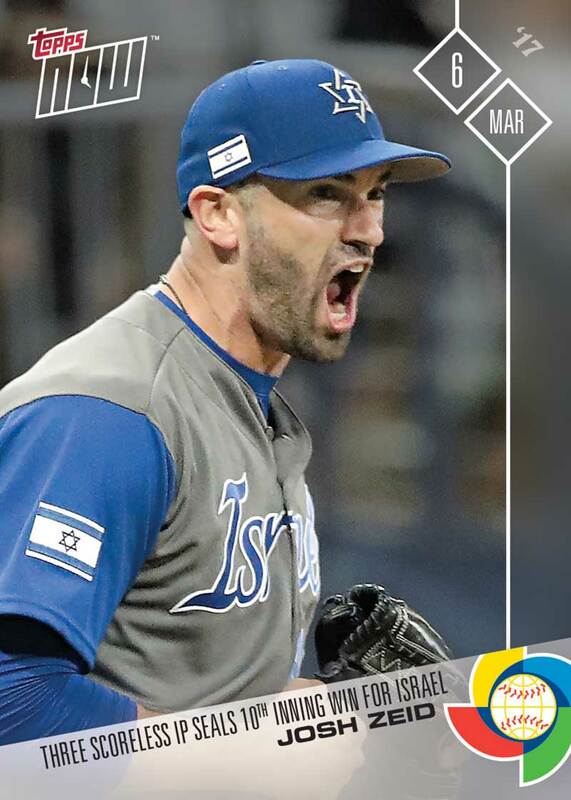 The World Baseball Classic tournament is a perfect avenue for this exciting program, as Topps Now, the revolutionary on-demand trading card program, captures amazing moments for baseball fans to collect as they happen, which are offered exclusively on Topps.com. 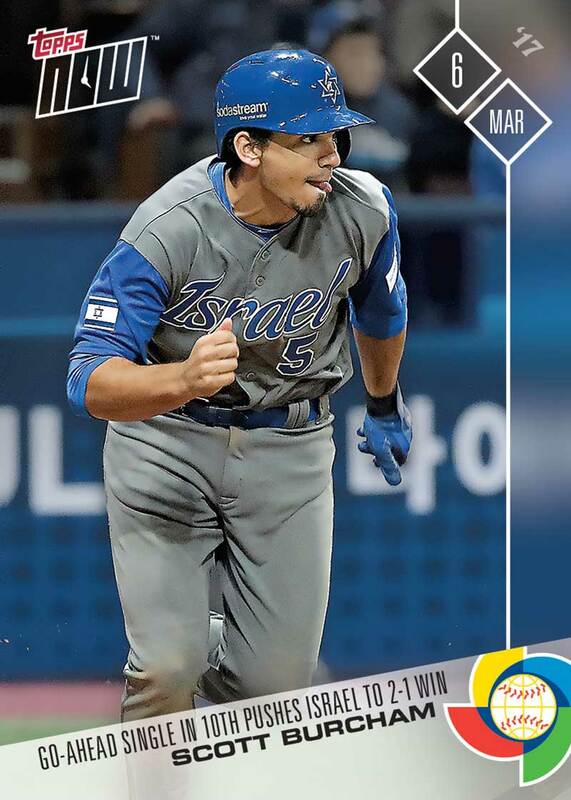 The first Topps Now cards of the tournament include three cards of Israel’s 2-1 extra-inning win over Korea. For the first time, Topps Now will be offered in Spanish for cards that highlight players from predominantly Spanish-speaking countries. Topps has offered cards in Spanish dating back to the 1960s and as recently as 2011, which commemorated the original Topps Venezuelan sets. The World Baseball Classic Topps Now program will offer daily cards of the top highlights as they happen for just a 24-hour window. Once the window closes, the cards will no longer be available on Topps.com. Team sets will be created once the quarterfinal round begins with a bonus card offered for each team as they progress through the bracket, similar to what Topps created for the Major League Baseball Postseason team sets. Topps will also capture game-used items to be used in cards such as game bases, baseballs, jerseys and more. Visit Topps.com daily to see the daily World Baseball Classic card offerings from Topps Now.